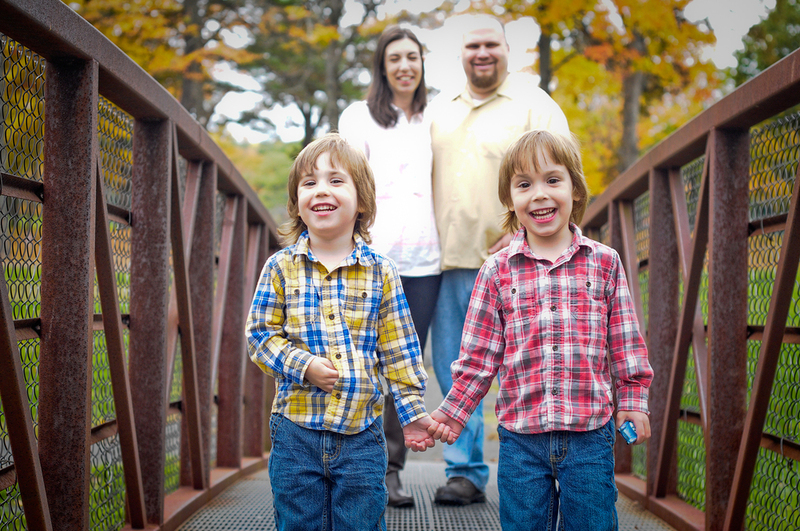 I asked Stephanie Vaughan, preemie mom/twin mom/NEC survivor mom/supermom to share her story with NICU Central. Here is her insight into some of the struggles and triumphs she and her family endured. Enjoy! Finding out that I was pregnant was shocking. Two years prior to getting pregnant, it felt as if my world was ending: our first IVF attempt had ended in an early miscarriage. After three years of struggling with infertility, we had finally decided to seek treatment. I had been diagnosed with endometriosis and after undergoing laparoscopic surgery, it was recommended that we go straight to IVF. The miscarriage was devastating. One year prior to getting pregnant, it felt as if my world was ending again: in the midst our adoption home study, I had lost my job due to company layoffs. My job loss came hot on the heels of Jeff’s own layoff six months earlier, when the distribution company he had been working for sold off a major territory. We had been able to maintain after Jeff’s job loss, but now, all plans to adopt had to be put on hold. Indefinitely. It felt like one devastating loss after another. During the time that I was looking for work, I tried Chinese medicine for infertility that consisted of weekly herbal and acupuncture treatments. After several months without success, I returned to Western medicine. It would take another six months of treatments with my new Reproductive Endocrinologist, and a second laparoscopic surgery, before I would become pregnant again. So, we were completely shocked it when finally happened. Ironically, I had been offered and accepted a new job the week prior to what would be the successful set of procedures. I had back-to-back IUIs on Thursday and Friday, and started my new job on Monday morning. Two weeks later, my RE confirmed that was pregnant. With my pregnancy was going well, I was released to a regular obstetrician at eight weeks. Aside from what felt like extreme nausea early on, I loved being pregnant. I took prenatal yoga on Sunday mornings. I researched birthing techniques, settling on The Bradley Method. I even planned my own shower, down to the smallest detail. And Jeff and I discussed names: boys names, girls names, unisex names. At 20 weeks, we found out that “Baby A” was a boy: Shaymus. Jeff announced his name immediately. Then, we found out that “Baby B” was also a boy: Morgan. Jeff announced his name immediately. Two boys. We couldn’t have been happier. On October 23, we celebrated my baby shower. At a routine ultrasound four days later, the technician mentioned that my cervix was measuring short. 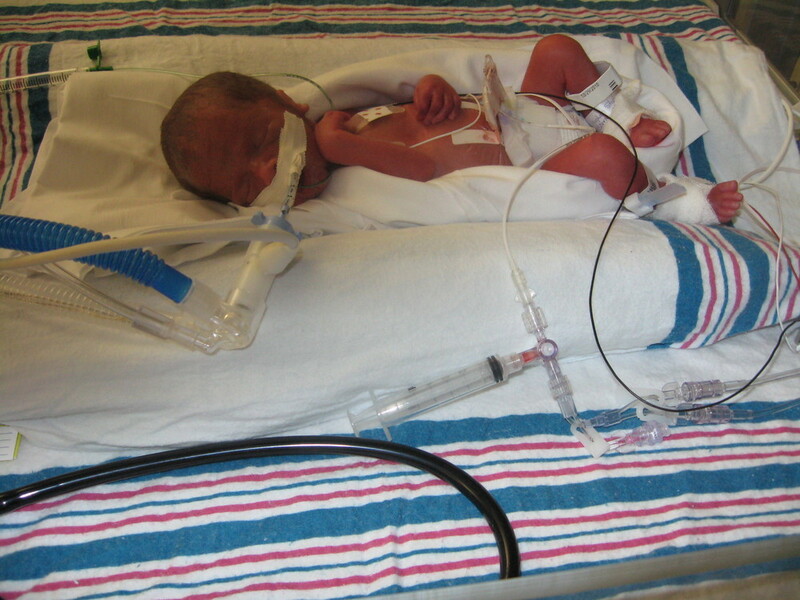 After a whirlwind two-and-a-half days of pre-term labor and medically-induced pulmonary edema (water on the lung), Shaymus and Morgan were born via C-section on October 29, 2010 at 28 weeks, one day gestation—nearly three months early— each weighing less than 2.5 pounds. to Yale-New Haven Children’s Hospital when the doctors at Bridgeport Hospital suspected he had developed Necrotizing Enterocolitis (NEC), an inflammatory disease predominately due to prematurity that leads to necrosis (death) of the intestine. Shaymus remained at Bridgeport Hospital. Once at Yale, Morgan underwent emergency surgery. He had one perforation in his small intestine, and five smaller areas that were about to perforate. Approximately eight inches of his small intestine were removed. For his age and size, that was equal to approximately 20% of his small intestine. Immediately after Morgan’s surgery, the surgeon came into the waiting room, sat down across from us, and began to explain how the surgery went and what we could expect for Morgan’s recovery. Morgan was “very sick,” sicker than the doctors had thought, but had tolerated the surgery well and the surgeon was optimistic about his recovery. In another 6–8 weeks, Morgan would need to have a second surgery to reconnect his intestine. The prerequisite for the anastomosis (reconnection surgery) was for Morgan to weigh at least two kilograms (4 lbs., 6.5 oz). Morgan would need to double his birth weight before the surgeon would consider operating on him again. In the interim, he would have an ostomy pouch to collect eliminated stool and gas. What I heard the surgeon say above anything else was that he understood that Morgan was a twin whose brother was still at Bridgeport Hospital, and that if things went well, there was the possibility that Morgan could return to Bridgeport while awaiting his second surgery. None of us could have known how vehemently Jeff and I would latch on to what we perceived to be a promise, not a possibility. Prior to that conversation, I didn’t have any expectation of what would happen after surgery. Whether Morgan would remain at Yale or return to Bridgeport Hospital hadn’t even crossed my mind. Until the surgeon mentioned of it. The possibility of Morgan returning to Bridgeport Hospital never came to fruition. For the first two weeks following the surgery, I would call his surgeon every two or three days to discuss Morgan’s progress and his weight gain, and to ask about him returning to Bridgeport. Each time I would call, the conversation would end the same way: the surgeon would not allow Morgan to leave Yale. And each time, I would hang up the phone and cry. Ultimately, I decided to stop asking. I decided that I needed to let go of what I wanted to happen and accept the reality of what was actually happening: both boys were doing well, and we were adjusting to being the parents of two preemies in two different hospitals. We briefly discussed transferring Shaymus to Yale for our own convenience, but felt he was better served in Bridgeport’s more intimate setting. Ultimately, we felt both boys were where they needed to be. Morgan remained at Yale for another 105 days. We felt an overwhelming sense of relief when his surgeon performed a successful reconnection surgery. And we were thrilled to bring him home to his brother on Valentine’s Day 2011—three weeks past his original due date. With the benefit of some time, and a shift in perspective, I have begun to view our initial conversation with surgeon differently. Maybe he was simply showing compassion to a new mother who was already separated from her two tiny, sick babies. A mother whose babies would now be separated from each other. Maybe I heard what I wanted to hear. Or maybe, I heard what I really needed to hear. What if by offering us the possibility of Morgan’s return to Bridgeport Hospital, he was doing just that: offering us a future possibility. What if he was really offering us the possibility of a future. What if he was really offering us hope. What if he was really offering us time. Or, what if he was really offering us just enough possibility, hope and time, to allow us to reach the point when we would have the confidence to make that decision. Ourselves. When we decided with confidence that it was in Morgan’s best interest to remain at Yale, and that it was in Shaymus’ best interest to remain at Bridgeport Hospital. Before coming home, Shaymus spent 85 days in the Newborn Intensive Care Unit at Bridgeport Hospital; Morgan spent a combined 109 days in the Newborn Intensive Care Unit at Bridgeport Hospital and the Newborn Special Care Unit at Yale-New Haven Children’s Hospital. They are now happy, healthy four-year-olds. Through our NICU journey, I have learned that the universe can be fickle (for lack of a better word). Simply put, there is a randomness to the universe that by no means reflects, or defines, a person’s worthiness. I can’t begin to understand why our sons survived and other babies in similar circumstances did not. Or why, at every critical point of each of our sons’ journeys, the outcome was always positive while for other families the outcome was not. Of course, each of our sons’ positive outcomes was not without moments of immense anxiety and fear for me. Yet, I am grateful for all that Morgan, Shaymus, and our family has overcome. The Morgan Leary Vaughan Fund (Morgan’s Fund) is an all-volunteer, public charity dedicated to Necrotizing Enterocolitis (NEC). Its mission is to promote public awareness about NEC and the potentially devastating effects it can have on preemies and their families, and to advance research to prevent, diagnose, treat, and ultimately, cure NEC. Named after Morgan, it celebrates his survival, courage and strength.